Now open to the public, the North American International Auto Show, held annually in Detroit, is hosting a unique floor display for none other than the famed, Lightning McQueen. 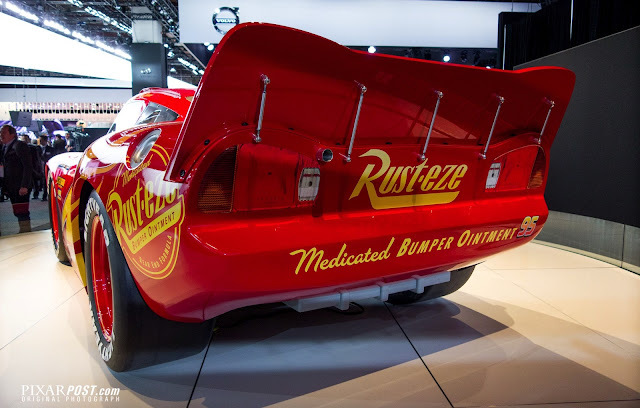 On display from January 14-22, what makes this exhibit special is that it's not only promoting the release of Cars 3 (in theaters June 16, 2017) but is also allowing viewers a close-up look at one of the only 100% scale versions of the Rust-eze racer! Having attended the Pixar press event the week prior, we got an early look at McQueen but wanted to make sure we also provided fans a look at the floor display as well. Of course, we all know that Pixar is know for their acute attention to detail, but when seeing McQueen up close, we couldn't help but be taken aback at all the specifics. His tires don't just have the word "Lightyear" painted in white letters on a basic black tire — these are custom made raised white letter tires. McQueen's blacked-out lightning bolt on his front wheel well is various tones of black (layering glossy and metallic paints). We also really enjoyed taking a close look his updated graphics for Cars 3. Lightning is looking as stunning as ever, and we can't wait to see him race on the big screen against the new hot-shot rookie, Jackson Storm. To show the evolution of McQueen's graphics, below are a few looks Lightning had in the first two films. What do you think of McQueen's new design? Leave a comment below. Purchase tickets to the Detroit Auto Show - open from January 14-22. Lightning McQueen is on display at the 2017 Detroit Auto Show for all to enjoy. Even better is that you can get a really close-up look at his updated graphics in the Cars 3 film - due in theaters, June 16, 2017.